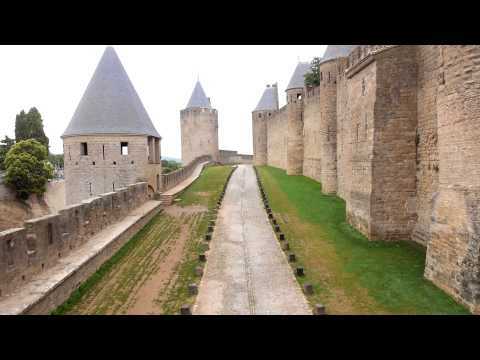 The Cité de Carcassonne (Occitan: Ciutat de Carcassona Occitan pronunciation: [siw'tat ðe kaɾkaˈsunɔ]) is a medieval citadel located in the French city of Carcassonne, in the department of Aude, Languedoc-Roussillon region. 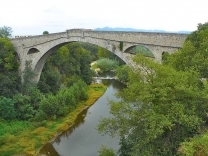 It is located on a hill on the right bank of the River Aude, in the south-east part of the city proper. Founded during the Gallo-Roman period, the citadel derives its reputation from its 3 kilometres (1.9 mi) long double surrounding walls interspersed by 52 towers. 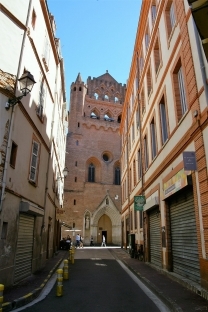 The town has about 2,500 years of history and has seen the Romans, Visigoths, Saracens and Crusaders. 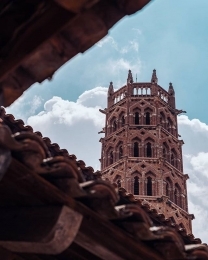 At the beginning of its history it was a Gaulish settlement then in the 3rd century A.D., the Romans decided to transform it into a fortified town. The Roman defences were in place by 333 AD, when the town is described as a castellum. The original walls were supported by between 34 and 40 towers, spaced from 18 to 30 metres apart along the curtain wall. Each tower was semicircular in plan and about 14 metres tall. There were probably four main entrances to the town.